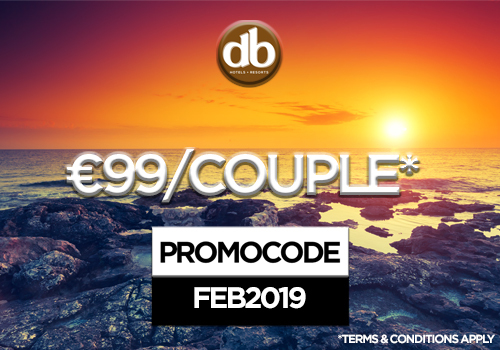 Special €99 offer between February & March! Home > Special Offers > Special €99 offer between February & March! Offer available until March 15th and is subject to availability. Use the PROMOCODE - FEB2019 to benefit from this special offer on your next All-Inclusive stay at db San Antonio Hotel + Spa! Click on the links above where it will direct you to the preferred hotel website. Booking window is open between 15th February 2019 and 15th March 2019. Offer is valid for a minimum of 3 nights stays between 15th February and 5th April 2019.